Get 25% DiscountLimited Time Offer! If you are like me, who writes a lot... you need a proofreader. Your words have the power to influence others, to build a connection and to show your personality. But a text with some silly grammatical mistakes can brake that connection almost instantly. That's why it is so important to proofread your content before submitting it for any use. That's why I am here to save you some money today. Introducing Grammarly, a tool that can not only find and fix your grammar mistakes but gives you tons of suggestions to improve your writing. If you are interesting in putting Grammarly in use, here is a good news for you. For our readers, they are offering flat 25% on all their plans. And here in this article, I'll show you step-by-step how to get discount on Grammarly. 1. Click ﻿this ﻿discounted﻿ link to go to Grammarly's official site. 2. Now, click on the "Go Premium" button at the top of the page. You can notice 25% off is mentioned there. 3. Now click on add extension button. 4. 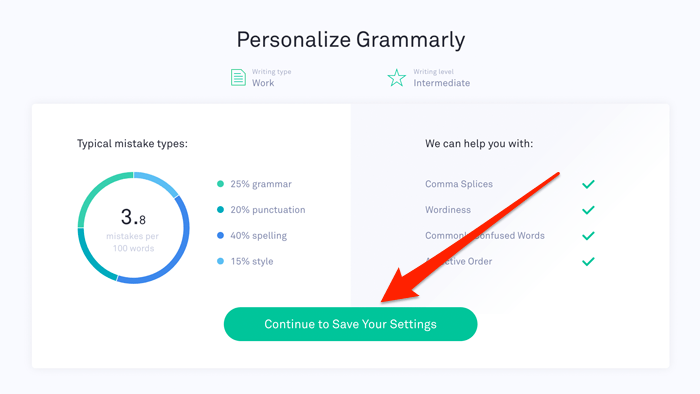 On the next screen, you will get the option to adjust Grammarly to your writing needs. Select the appropriate options and click on Continue button. You can skip this option as well. 5. Again click on Continue button to save your settings. 6. Next, enter your email address, password and your Name for signing up. Here you can sign up with your facebook account as well. 7. Next, on the Welcome screen, click on Get Grammarly Premium button to proceed for signing up with the premium account. 8. Now choose your Grammarly special offer. For the best value Grammarly recommends annual plan. 9. On the next page, enter your card details and click on submit button to make your payment. That's it. Now enjoy your Grammarly Premium account and write your content flawlessly. Congrats for successfully availing 25% Grammarly discount offer. I do believe this Grammarly Discount coupon will help you to save your hard-earned money. I did extra work to get this special discount offer only for you. But I have to say, this offer is for the limited time. If in case it expire at the time of your purchase, then kindly let me know through contact page, I’ll update the link. If this offer impresses you, share it with your friends to help them to solve their problem of proofreading at a very low price. Any tool which checks grammar works for me Ankit. I get a bit lazy at times. I do like using WordPress but sometimes, again….I’m human and lazy lol! Grammar – poor or proper – can repel readers or can draw in readers. Simple word usage and placement makes that difference, especially if you’re not a native speaker. Happy to tweet this Ankit. Thanks for the share and the sweet promo! As I’m not a native speaker, I always need a Grammar checker tool to check and fix my grammatical errors. I’m proud to say Grammarly helped me to improve my Grammar by almost 70%. I’m working on improve it even further. Thanks for your tweet and I’m glad you liked this discount offer. Grammarly is great tool for grammar checking. I am already using it and recommend it to my friends. Agree! I’m also in love with Grammarly as suggest my readers to use the same. Anyone who is looking for Grammar checker tool, a proofreader and a plagiarism checker tool, I highly recommend them to go with Grammarly. It is the best tool available for bloggers, students and content writers. Thanks for sharing Grammarly coupon code. I’m already using this tool but definitely going to recommend to my friends. Glad to hear that you are already using Grammarly. Thanks for recommending this special deal with your friends. I already used. Grammarly is agreat tool for grammar checking. I am already using it and recommend it to my friends. thanks for info. I just started using this tool and found it really helpful for me, as I am a student from India who is very weak in English writing. So this tool will help me to write correct essays for my school projects. I must say this is the best Grammar checker tool for students and also a best Proofreader and plagiarism detector tool for teachers. I hope it will help you to write better and flawlessly. Wow Very useful post for grammar checking. I like your post And I also using it.Grammarly is the best tool which checks our grammar. Thanks to share this helpful post with us. I couldn’t agree more. Surely Grammarly is the best and highly recommended Grammar checker tool. It’s free version is pretty good. But in case, you need full of its features, then Grammarly premium is recommended. 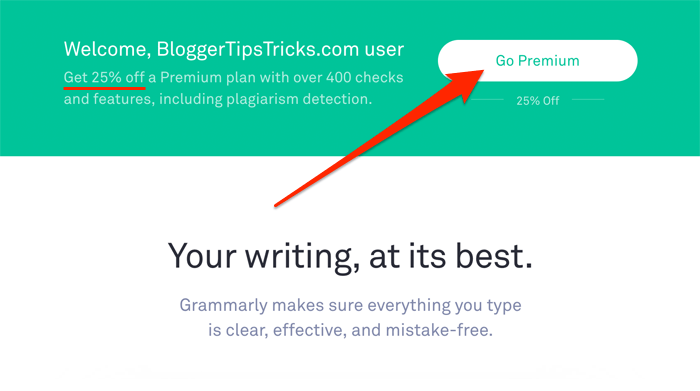 I hope this discount offer will help a lot of bloggers and content writers to get Grammarly at cheap price. Since im new to blogging i was always wondering if I could get a grammar tool. I would surely consider using this very soon. I am slightly wary of these grammar tools, I would like to test waters before taking a plunge. May I know if they offer full feature trial version for a limited time period? Currently there is no such option available. But you can sign up for free and test their features. This could really help me boost My article writing.. gotta grab this promo code too! i want to get the 25% off coupon to work? Yes Michael, click the link to get the discount. How to l get the 25% off? I’ve tried but had no luck! Simply unblock the discount link by using any share button and enjoy your 25% off on Grammarly premium account. Hey Ankit, Thank you for writing about this Grammarly Black Friday sale. I have been waiting for it for so long and finally, it is here. This offer is extremely useful for college students and teachers. Thanks again! It simply works, thank you! Thanks Ankit…Happy Thanksgiving to you and your family. You have shared a really nice discount, though I have already purchased Grammarly. Saving a single penny is a saving. I agreed the quote in the post. Until I was not using Grammarly, I was not aware that I was making so many grammatical mistakes. Luckily I got to know about it from one of my co-blogger. Since I installed the extension on my browser, My writing skills have been improved and I have noticed a confidence in me. This is the time to move to the paid subscription. Thanks for the awesome promo. Going to but it tomorrow (Of course from your link). I wanted to know is the Grammarly for students discount still available? I need it to proofread my exam papers before submitting them. Thanks in advance. Yes, the offer is still available and running. Just follow the steps and you will get the Grammarly student discount. Thank you for sharing the 25% Grammarly discount. It certainly a good deal for me. I would like to find out if you use the Grammarly Plagiarism Checker to check or upload my essay or thesis in Grammarly, do they upload my paper to the database for comparisons. Cos I worried that after I had used the Grammarly when submitting to my university, my university will say I plagiarized. My school is using Turnitin to check plagiarism. By the way, anyone here familiar with the use of Grammarly Plagiarism Checker for academic usage? Please advise. Thank you. Thanks very much for posting this Grammarly Black Friday and Cyber Monday sale offer. Worked a treat. Saved a few dollars for a Uni student with no money. It works incredibly well and assists in making sure grammar and spelling are correct. Well done friend. Yeah , Grammarly is perfect tool who is having problem with English writing skills. It helps me a lot in correcting my spelling mistakes and also Capitalise words accordingly..
Great Share! Got the premium subscription. Thank you, Soo much, I was really exited to Grab this offer, Your post gave me clear Idea about Grammarly……. After long time I found it in ur blog……. 🙂 Thanks for share….. I like the Grammarly tool to check my all grammar checking. And I was using it in all my projects, and I’m suggestion this to my surrounding. Thanks for this coupon code information, I will be surely using this and enjoy the discount. And the major advantages of using this Grammarly app is because of this app my English writing skills and grammar knowledge has improved a lot. I’m using the premium offer only. So I’m very excited to grab this offer. Thanks for sharing. Glad you liked this offer. Cheers! I am also using grammerly but I am facing one problem that this extension is not running on Quora so I made a lot of mistake there. I don’t know why this not work there? I’m facing the same problem as Quora does not support Grammarly. They have given some technical reason, so I copy entire text to Grammarly editor to correct it and then submit my answers. It’s a weird kind of task, but I do that. I think you’re doing the same. If you find any better idea, then please share with us. Yes, offer has been recently changed. Hey man, just wanted to say thanks for hosting the Grammarly coupon code! Hi, my name is Johnny. I tried to get the Grammarly premium yesterday but my payment was continuously declined. I don’t understand. I have enough on my visa debit card but Grammarly won’t accept payment. I really will love to have this discount offer. Hi Johnny, kindly try using different card or contact to their support team. They will surely assist you. Hi Fa, go to this link and you’ll see the discount window at the top. Cheers! First of all, wish you Happy New Year and Christmas. I am a student and was needed Grammarly to proofread my college assignments. With this Grammarly Christmas offer, I saved 25% of my money and now I will buy some goodies from this money for my family and friends. Thanks for giving me this wonderful Christmas gift. God bless you mate. Thank for your New Year and Christmas wishes. I wish you the same. I use Grammarly tool for a long time. I was using free Grammarly tool but today I’m going to purchasing this tool because you told me this offer. It is very helpful for me. I am glad to your post. Honestly saying, Grammarly is simply awesome. I am using their premium service for months and worth every penny. Grammarly is one of the best tools one can use while writing. I’m using it for a long time and It’s an awesome journey with Grammarly till now. Newbies should use this for sure. Have a Good Day, Ankit. The promo code worked wonderfully. Thanks so much for sharing. I needed Grammarly premium plan at affordable price.Thanks again!